Being the Devil's son is hard. Being his only half-human son with a love of all things small and cute? Almost impossible to live with. Lived was the product of Lucifer's outing to Vegas one weekend where he ended up in bed with some pretty chick. When said pretty chick got preggers and then killed shortly after giving birth she took the baby down to Hell and forced dear daddy Satan to take full custody of tiny Lived, then promptly left for an afterlife in Heaven. The single father tried his best to steer his son on to the glorious path of death, destruction, and chaos in hopes that one day Lived would follow his footsteps and one day rule over Hell and all demon- and devil-kind. After a long 17 years of struggling to get his boy to enjoy kicking puppies and pushing over old ladies Lucifer had almost given up hope. When he get the report from Lived's latest assignment (to go collect some eternally damned souls that had refused to pass over willingly and were haunting a corn field, instead of guiding them down below the little bugger had gotten them into heaven. It seemed his mom was sleeping with St. Peter) he just about snapped. Then one of his advisers suggested forcing Lived to go live with humans for awhile, who better to corrupt a young half-devil than some corrupted humans? And so Lived was "grounded" and sent to Void City, where an uncommonly large amount of new Hell residents seem to come from. Personality: Lived is an all around sweet guy. He dislikes fighting and conflicts of all kinds, but will use his powers if he thinks it is for a good reason. He is rather naive for all that he grew up in Hell, part of that is his unwitting ability to make friends, even among the demons and devils Lived brought out the best in the supposedly evil creatures, all of whom did their best to shelter the little half beast. Behind Satan's back of course. 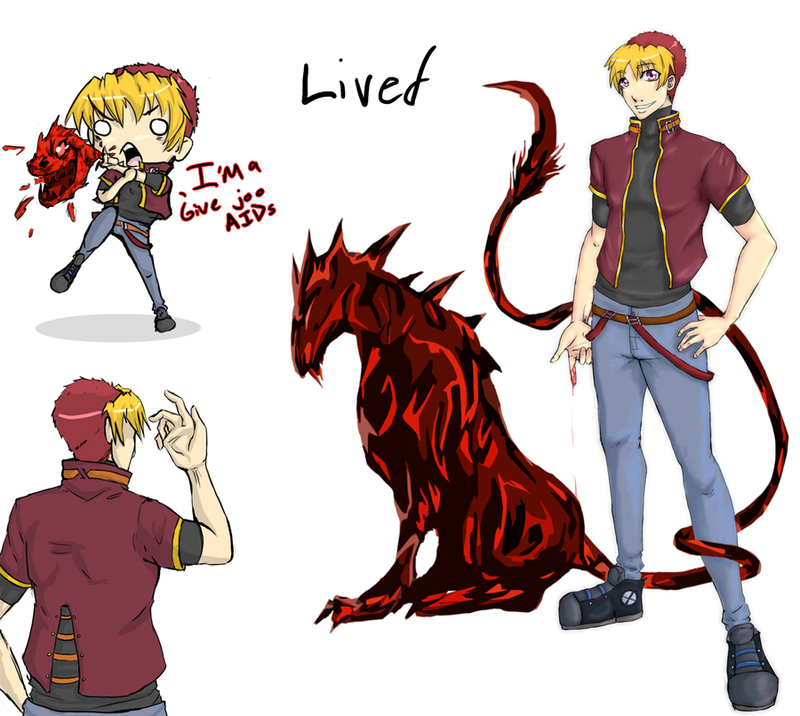 Lived's blood, when shed, transforms into a beast drawn from the devil side of his soul that protects him, the more blood shed the stronger it becomes. If he sheds enough blood his devil side completely awakens and transforms his own body. He can also control what his blood becomes if he cuts his skin himself, usually he only does this to create wings so he can fly to where ever. Aside from that Lived has increased strength, speed, and stamina. He especially loves cats. Any cat and all cats are deeply loved. Lived is allergic to all perfumes, and thus tries to avoid women and all Macy's department stores. When Lived has an allergic reaction to perfume he sneezes out portals to hell, which pending on the severity of the sneeze are open 5 seconds to 10 minutes. In which time denizens of the lower planes may or may not pop through!